We are off on the trip tomorrow morning. So last blog post for at least a week. Catlins was lovely and Joe saw penguins! Loads of yellow-eyed penguins. And got photos. So I am now on the good list again. We drove into Kaka Point and found our hotel – another nice place complete with kitchen, and then went and got a couple of burgers and kumara chips before heading to the hide to look for penguins. And saw about 7 penguins come in. Hurray. The next day we drove to Curio Bay and saw the petrified forest which was nifty. We stopped at the falls as well, but then had to hurry back to the bay to see penguins. We stayed at the hide for over 3 hours watching penguins come in. So Joe had a good day. Now in Dunedin. Shipping dive kit back home and sorting out the rest of our stuff before getting on the boat tomorrow. Joe has counted his Stugeron tablets and figures he has enough. I’m doing the laundry and generally sorting stuff. Everyone have a wonderful New Year’s Eve! We are sleepy today. Kiwi watching on Joe’s birthday and we got back to the hotel sometime around 1am this morning. Then had to be up at half past 8 to pack and check out by 10. The ferry is at 3.30 this afternoon. We didn’t do much on boxing day. Thought we would be kiwi spotting but it was postponed to the next day. So we just pottered about. Joe’s birthday and yes, he now knows he’s spending 7 days on a boat. He’s wondering if I really like him or if I’ve taken out a secret insurance policy. If you want to see penguins it means getting in a boat! So there. Meanwhile, I’ve had several offers of marriage if Joe doesn’t like the trip. Joe is considering which one I should accept. Meanwhile, we walked out to Ackers Point and the lighthouse. Saw loads of birds and had a lovely walk. Then we napped so we’d be awake for kiwi spotting. But before kiwis it was Joe’s birthday dinner. We had a lovely meal then they brought out a birthday cake – seems our travel agency ordered one for him! and it was huge – great big chocolate and chocolate liquer with raspberry and banana filling, passonfruit topping, and loads of fruit on top. It was lovely and tasted wonderful but we could barely make a dent in it. So we fed the staff and the people in the bar! The kiwi watching trip left the wharf at 9pm and we had a nice trip over to another part of the island. Joe managed to spot 2 blue penguins in the water – hooray! penguins! Kiwi spotting was interesting. We stayed on the boat getting briefed as it got dark. Once it was fairly dark off we headed into the bush. It was a bit spooky. But we found a clearing, all gathered together and waited. The guide had a whistle and a tape of kiwi calls and sure enough we heard something. He switched on a torch and there was an adult female kiwi standing in front of us! Really dramatic and quite nifty. She stayed around for a bit, even fed a bit, then wandered off. We saw two more, both young, one male and one female. So three kiwis which is pretty good going. We also heard kiwi calling and whistling in the distance. And had a lovely walk along a sandy beach looking at the stars – I’ve finally seen the Southern Cross. But not the southern lights which decided not to show. Still quite a nifty trip. Hope everyone has had a marvy Christmas and are all looking forward to the new year. We had a wonderful time in Fiordland. Got to Te Anau in good time and enjoyed walking around the small town. Did all our shopping for Christmas the first day and got food for Christmas. We were in another flat which was quite nice even if we had fairly noisy neighbours. Diving in Milford Sound with Tawaki Dive is wonderful. Just wonderful. The diving is only a part of it – it’s a whole day out with two dives included. So we were picked up bright and early (5 to 6 actually) and driven to Milford Sound. Had a good chat with one of the other divers who was riding with us and got information about what we were seeing during the drive. The tunnel is pretty spectacular and the view once out the other side – really lovely. It was a bit of a rainy start to the day though. So we get kitted up and off out on the boat. Stopped to look at a couple of points on the way to the first dive site – the scenery cannot be described. The really great thing about Milford Sound and probably the entire area is the fact that your sense of scale just goes away. Looking at waterfall it takes a few minutes to realise it’s three times the height of Niagara Falls. You lean back and look up a cliff face and it just takes your breath away but hard to realise it’s 700 metres high! The diving is wonderful. But then on our first dive we saw TWO spiney sea dragons. Real deep water creatures but they came up to see us. Not only that but one had eggs. Really nifty. We also got to see a octopus – our guide got a close view of the octopus as it headed for him then gave up and sat on a rock when the octopus saw our guide had mates with him. Just sat out there and watched us so we got a good view. We also had a professional photographer diving with us and I swear the octopus posed. And that was just the first dive. The second was on a wall and the life was spectacular. Along with huge black corals – these must have been hundreds of years old they were so tall. If you’re a diver go to Milford Sound and dive with this group! Between dives we got taken to the mouth of the fiord (called a sound cause the Brits named it but it’s actually a fiord – yep we got a geology lesson as well, though not how to spell it). So we got to see the sea and an old stone building – I think it’s suppose to be the oldest stone building in New Zealand. And greenstone. Then after the second dive we boated around the fiord seeing the waterfalls, getting information about the area, and just being given an excellent look around. We then went to the Lodge, had lunch, got shown photos of what we’d seen underwater with details of what it was (very helpful) and also got to look at the photos Paddy and Joe had taken. On the drive back we stopped at several points and got out to walk. Saw Chasm which is a wonderful waterfall, Deer Flats, and a stoat trap (the people who run the dive company are involved in several conservation efforts). Just a really nice leisurely trip back. Then to bed as we were up early again (well, we did go out for another of those wonderful meals – the food, wine and beer (as Joe assures me) is all wonderful) for kayaking. Picked up after 6 this time so a bit of a lie in. And again got told information as we drove along and had a tea break stop at a wonderful view point. Then off to learn how to kayak. Joe made me steer then complained. You are suppose to tack into the wind, aren’t you? [Joe comment: not in a kayak you aren’t.] But we had fun even if it was hard work. Saw much less of the fiord as we had to paddle every where instead of ride, but we did get to sail back to our lunch beach! Now that was nifty. And it was nice to see everything from the level of the water. And on the way back we stopped at different sites and saw even more nifty stuff. And over the two days we saw: fur seals, dusky dolphins (jumping out of the water), spiney sea dragons, octopus, black coral, loads of fish including deep water species, tube worms, loads of birds, but not a single penguin. They all buggered off on 10 December – must have heard Joe was coming to see them. However, Joe still managed to take nearly 300 photos in two days. So Christmas day was spent in the room slumped in front of the telly. We did manage to find the energy to take a walk along the lake and go the wildlife place to see birds. But most of the day was movies, including playing ‘spot the location’ during LOTR: Return of the King (or as one guide called it ‘Lord of the bloody rings’). Today we are in Stewart Island and hopefully tomorrow night is Kiwi spotting! And blue penguin spotting. Or Joe will really sulk. To swing on a string! Wheeeee! Guess what we did today? 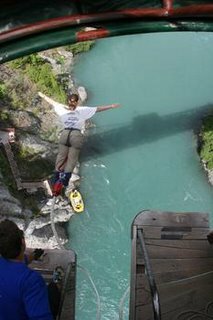 Yep, right off Kawarau Bridge the original site, only 43 metres and fun, fun, fun. I got told to stop bouncing though. And Joe got the photos and DVD to prove it. In Te Anau now after a very nice drive. The lake is pretty. Tonight we go for a pre-dive briefing and tomorrow we’re diving in Milford Sound. Then Christmas eve we’re kayaking! Have a marvy Christmas everyone! Back again! Right we were on Franz Josef Glacier, weren’t we? And having a great time. Cloudy overcast day with a little bit of drizzle now and again. But having a great day. Trying to climb huge ice steps and go down steep icy bits. They didn’t tell us we’d have to lift our leg above our ears to get to the steps! But it was fun. Then on the way back off the glacier it started to rain. Really rain. Pouring it down rain. And our guide (Cliff) was singing, in the rain, having a great time. We were wet. And we’d hear from in front of us ‘Oh Mickey you’re so fine, you’re so fine you blow my mind’. Hmmm. We did tell him not to give up the day job. We thought it couldn’t get worse, then Joe started to sing. ‘Hi Ho, hi ho, it’s down the glacier we go. With Cliff and an axe and an aching back. Hi ho, hi ho, hi ho etc.’ It was a rather wet and miserable group coming down that final stair way. But we were all grinning at the end. We’d climbed, we’d gone through little cracks in the ice, we’d clambered through a blue hole, we’d slid, we’d used our own axes, we’d seen Kea parrots, we’d had a great time. This morning however, did not want to get up. Nope. My back is very unhappy and wants to have a word with someone about going up and down glaciers. I did suggest to Joe that we could do a half day walk on Fox Glacier and he just gave me a look. So we drove to Wanaka instead. Stopping to look at waterfalls in the rain because yep, the rain has continued. Pouring it down. It is a bit drier in Wanaka though and tomorrow we’ll probably go have a look at Queenstown. Then off to Fiordland! Horray! Oh and photos. Am trying to upload though may not get the penguin sign up. And Steve, the cute penguin photos aren’t on the digital camera. They are on film. So you’ll just have to wait until Joe is back in the office! Hi! Yes, we’ve been enjoying ourselves. Please forgive any typos – I’m very tired and this keyboard is sensitive! Right, we left Nelson and drove to Kaikoura which is a wonderful place. Really wonderful. We’ve had the best meal of our trip – if you are ever in Kaikoura go to Finz in South Bay. Yum. The service was excellent, the food was even better, and the whole experience worth every penny. Kaikoura is nice little place. The dive we did was good, but not what we were expecting. We were expecting seals. Lots of seals which we did see on the rocks. It wasn’t until we got out of the water that they said ‘oh if you want seals you want to snorkle, not dive. You don’t get the seals on the dives.’ Well, gee. If we’d known that before we got in the water we would have snorkled instead! By the time we got out I was far too cold to do any snorkling. But we did have a very nice dive – very like UK diving really with lots of life and kelp. The next morning we got up early and went out on a whale watching tour. Run very differently from any others we’ve done. It was a large boat and we all sat inside while they raced off to where they thought the whales would be. The crew spotted and we sat inside watching informative slide shows or the map showing where we were, the compass heading, and the depth. We were only allowed to get up and go on deck when the boat had stopped. Interesting. But we saw three sperm whales (and I even got footage of them diving), dusky dolphins playing around the boat, and a seal colony. We also saw wandering albatross! Really nice trip. 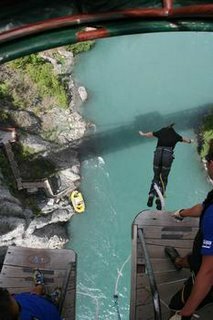 We got off the boat and headed out for Hanmer Springs. We only spent the one night there so got there, got checked into our chalet (a whole one bed place to ourselves! ), and then headed for the thermal pools where we had a soak for about 2 hours. 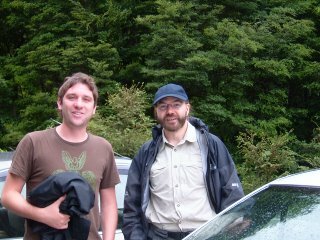 Then up and off the next day for Franz Josef. We took a slow drive through Lewis Pass and down the west coast. Stopped to see things and just generally ambled down. Just before Panakaiki (the pancake rocks and blowholes) we saw Joe’s penguin sign – a little penguin in a yellow diamond. Yes we have photos. And photos of Joe standing in front of it. We drove very slowly the whole 10Km but didn’t see any penguins. Panakaiki was interesting and we were watching Hector dolphins off the coast more than the rocks. Well, the rocks don’t move much. Also saw loads of birds. Then we went to Hokitika where they have loads of greenstone shops. Had a quick look and ended up in the supermarket getting lunch for the following day (today). Got to our place to stay and found we are in a tiny little room – from our own nice chalet to a tiny room barely big enough for a double bed! Oh well, the bar had happy hour. Then we were up far too early this morning after last night and off for a full day glacier walk. This was hard work! But fun. Climbing the face of the glacier was difficult – the steps were huge. But it doesn’ t half cure a hangover. Right, this place is closing and the poor bloke wants to go home. So more update later and hopefully some flickr photos uploaded! Now in south island and so far so very very good. The ferry is nifty and the trip over is lovely. I kept hearing that Cook Strait was nasty but it was quite calm. We did see the big dark clouds over the south island though. Going through the sound is beautiful and Joe took an entire roll of film. I did say that as every thing says Nelson is the sunniest area of NZ that we would have rain and yep, we’ve had rain. But it was a lovely drive to Nelson (and I must say that the ferry terminal in Picton is much nicer than the one in Wellington!) We went along the coast – little twisty roads climbing and going down into bays. Very nice drive. I think we got a car upgrade though as this one is much bigger (we can fit everything into the boot!) Still I’m getting used to it. So lovely dinner last night. Our hotel is way out, between Nelson and Richmond (yep, little town called Richmond!) probably a touch closer to Richmond. So we have to drive everywhere. But we headed to a place called Waterfront and had the best seafood platter – prawns, scallops, crab, white fish, salmon, and mussels with new potatoes and a very good salad. Lovely food and nice people. We also had a huge pudding – Joe had the upside down apple pie and I had the passionfruit and lemon meragne. Very nice but very large. Today we were off to go diving. A place called Pupu springs (it’s full name is longer but I don’t have it here). Our cave dive and drift dive were off – the path and steps to the cave dive were being worked on so we couldn’t get to it. Fish Creek is empty of water, so not much good for diving! But the springs were lovely. Very very clear water, very very cold clear water. There were trout, dancing sand in the springs, dancing rocks, loads of little crayfish, and I saw a small eel! Up close and personal even. We managed to spend about 40 minutes in the spring so a very nice dive. Though they do have pretty strict rules – only four divers at a time (there were only three of us so no problem) and you can only spend 15 minutes in the spring. We were the only three divers there so we had no problems – we’d come up and check to see if anyone was waiting, there wasn’t so we went back in. Joe got some good photos and video! Speaking of which, we do promise to try to find a place to upload photos! It just takes ages and not every internet cafe will let us do it. Yes, we have been traveling and not able to get to an internet connection. No really, no electricity, no nothing. Honest. Well, ok, so we were having a great time and sort of neglected to check for internet places. The concert and dinner was fun. We had a good time, enjoyed the dancing and singing and had a good dinner. The next morning we went to the geysers and crafts centre. That was good – walked all over the park looking at the mud pools, hot pools, river, and geysers. We then drove to Taupo to have a look at NZ’s largest lake. Joe got out of the car, took a few photos, and said ‘right, we’ve done this then’. I thought it was quite nice. Then we drove to Napier which is a lovely place. The town was pretty much destroyed in 1931 by an earthquake and was then rebuilt within 18 months using all the latests designs and techniques. So it’s a beautiful Art Deco town. The first night we walked into town and ended up in a Spanish tapas place. Had an excellent meal. Next day we spent the morning doing the Art Deco tour of the town and walking about. Then in the afternoon it was wine tasting in Hawkes Bay (can you tell this was my sort of day?) We had to introduce ourselves in the mini-bus on the wine tasting tour (8 of us and the guide) and say what wine we liked. Joe introduces himself then says ‘I don’t drink wine’. There’s always one in every tour! The guide broke the news to him that he was on a wine tasting tour and pretty much stuck. But we had a good time. Joe would listen to the information about the winery then when the wine was poured, disappear off. Of course, one of the other women from London came over to me and said ‘keep him around and you’ll get double the tasting!’ Now I know quite a bit more about 5 wineries in the Hawkes Bay area – definitely like it! The drive to Wellington was nice – right through a gorge which was lovely. But pretty much the scenery has been very much like home with farms and lots and lots of sheep and cattle. Wellington is lovely. We rode the cable car yesterday to the Botanical Gardens and a view over the city. Had a coffee in the cafe at the top. Today we went to the main museum which was great. Lots to do and see and quite tiring. Tomorrow we’re off early to return the car and take the ferry over to the south island. We get another car once there and are off to Nelson. Freshwater diving the day after! So, the dive on the Rainbow Warrior was cancelled. Not enough people on the boat apparently. There we were first thing in the morning and our main dive is cancelled. Gutted doesn’t even begin to describe it. However, the nice woman in the dive shop rings her mate who runs dives to the wreck out of Matura Bay and he can take us. Hooray! So we have to be at the bay by 1.30 in the afternoon as he has to finish work before taking the boat out. Luckily we’d been to the memorial the day before so we knew where to go. Now we have a morning to spend in Paihia. So we went for breakfast and checked out the little shops and town. Also saw a nifty looking ‘Aquarium, restuarant, bar’ nice place for dinner thinks us. And after a wander through the place we head off for the bay. We had a nice drive to the bay and then went on a different route to see the sights and over looks. Beautiful roads, beautiful bays, wonderful drive. We got to the place (a holiday park on the beach) a bit early so spoke to the woman in the shop there. We bought a couple of t-shirts and wondered about the diving when the woman asked what time we were suppose to show up. When we said half past one she smiled and said, oh you’re very early as he’s always a bit late. Hmmm. We drive in and see a small motor boat. Hmmm again. Yep, that’s the boat. The one hooked up to the tractor with bits hanging off. Everyone finally shows up and the good thing is there are only 6 of us going diving. So it’s a peaceful dive. But it is a small run business – just the bloke and his son. And if we hadn’t been pretty experienced, confident divers this would have been a scary experience. But in all he’s really nice and the trip went well. We got out to the wreck and, despite ear problems, got to do our dive. The Warrior is a wonderful dive – full of life and small enough that you can really see what you are diving. The statue that was put on her in July is already starting to be covered with life. And the fish are not shy – they come right up to you. We skipped the second dive as we both had problems clearing. Probably shouldn’t have done the first dive but that was one we couldn’t miss! Back to Paihia very late however; took ages to get the boat out and sort things. We had to rinse all the kit and get it all packed away and chat to the dive operator. He obviously does it for the love of diving and not for the money. So we got back to Paihia well after 8pm. Into this nice posh restuarant looking like something the cat dragged in (both of us looked like we’d just surfaced from a dive – funny that). But they sat us and fed us. We were in 35 South which is right on the wharf and has huge aquarium in the centre. Lovely place and the food was wonderful (right, who dreamed up maple syrup whiskey? Canadians? But it is very nice over venison) but the service was quite slow. Still we enjoyed dinner then off to the room to sort kit. By this time it’s night and I’ve not seen the southern sky at night yet. So we grabbed a couple of g&ts, head down to the beach, find a bench, and sit and watch the sky and waves while having a drink. Very nice ending to a fun sort of day. Today was simply a driving day – straight down to Rotorua and our hotel. We’re off out tonight for a concert and dinner – traditional Maori concert and dinner!